In my opinion, you can’t have too many Adirondack chair plan varieties. This is a terrific project that is good for any skill level. In fact, this was the first large scale project that I tackled after getting back into woodworking in the early 1990’s. The Adirondack chair is a classic item. It comes in many shapes and styles and provides a framework for you to experiment and test your design skills. The structure of the chair is rather basic, yet stylish. I have seen some creative people come up with some designs that have landed in the pages of the higher end outdoor furniture retailers. I am occasionally asked about plans for the “martini glass” Adirondack chair or the “Old ski” Adirondack chair. Let yourself experiment with this one. Here are a number of different free Adirondack chair plans. The plans are not listed in any particular order. It is all a matter of your personal taste. You can reach the full wood plan by clicking on the picture. Enjoy! Ubuild Adirondack chair plans. This chair is more like a “chair” with 4 legs as opposed to the front to back style of most Adirondack chairs. 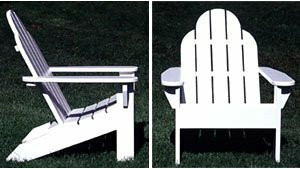 This can be very useful since your typical Adirondack chair can be difficult to get in and out of if you are up in years, or have a bad back. A more elevate style (like the one below) is a great way to scale the chair so that it is functional for the person who will be using it. Stylish too. Hometime Adirondack and Patio Furniture. If you are a fan of DIY television shows, you will probably recognize the people building this one. These plans are from the people at Hometime. They also provide plans for a nice side table and footstool. 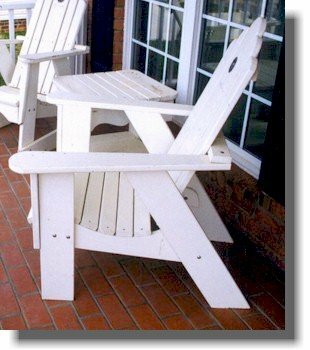 This is a classic style Adirondack from Popular Mechanics. As expected these plans are very well laid out with a great exploded view of the project. This is a direct download of a chair known as Jake’s Chair. This plan has been around for a while and has always been free. You will probably find it in many places, but we felt that we couldn’t write about free Adirondack chair plans without including “Jake’s Chair”. When you click on the image, you will be prompted to download the free plan file. Don’t be afraid to mix and match some of your favorite features from all of the chair designs above. You might like the concave back of one of the chairs, but prefer the scalloped look of another. You might prefer a straight arm to the curved arm. Come up with your own plan. There isn’t any right or wrong answer. If you do come up with your own, send us a picture to post here. Does anyone know of a plan to build built-in adirondack style seating on a deck rail? I am trying to get the plans for Jake’s chair but when I click on the image it doesn’t prompt me to download the plans. I don’t see anywhere to download them. Sorry about that. The file was moved and is now back in place. You can download the Jake’s chair plans at http://www.woodworkcity.com/adirondackjakeschair.zip (or by clicking on the image). It should be updated now. I am looking for the adirondack plan that is tall and wide, yet a rocking chair. Do you have any thing that fits that bill? I’ll see if we can locate an Adirondack Rocker plan and will post when available. Thanks for the request. We love finding new plans for our users. I just a finished a pair of these fro Popular Mechs. Great step by step plans and drawings. They are very comfy. Looking at a few other plans, I could see a few places where I would simplify the chair designs I just built. We would love to see a picture. We’ll publish and put you in the spotlight! Thanks for using http://www.woodworkcity.com. did you ever find plans for the bar stool. I saw some at the beach and they are awesome. They are pricey thought. I made a chair and footstool from old pallets. Good way to reduce, reuse, and recycle. Not to mention, you can get used pallets for free. HELP! Need plans for Adirondack style bar stool; dimensions approx. 25W x 22.5D x 52.5H Can’t find the plans online, free or otherwise. Any advice? i reduced the size of the original plans i ordered from NEW YANKEE WORKSHOP and they worked out perfectly. Simply reduce all the numbers by 30 % and you will have what you want . ps: also not to push for nyws but you want find a better adirondack chair or loveseat design anywhere. I am looking for plans to build an Adirondack Bar Stool. Are plans available? Not sure that I know what that would be. Could you describe it a bit and I can see what I have for you? I would like to build an adirondack chair for my 1.5 year old daughter. Are there any tips to taking the original plan from the second chair and scaling it down? I can’t give you too much advice other than to say reduce by a factor that makes sense for the size of your daughter. There will be a lot of trial and error, but you should be able to lock on on a scale. If I were building it, I would find another child’s chair (doesn’t have to be an Adirondack) and figure out the seat height and arm height. From there, I would do the math on the ration that I would have to scale it. I would make those changes and adjust things as needed. Once you have the frame together for the second chair, you can essentially skin it with the slats. PS: Try to find a book at the Library on woodworking with/for children. You’ll find some on google sketchup. To get to the free plans, click on the image of the chair that you like. Each picture is linked to the plan. After taking another look at the UBuild plan, it is clear that a lot of trial and error would be involved during assembly. I could see a couple of immediate questions coming up without a measured drawing or exploded view of the plan. Have you tried any of the other plans listed above? The plan from Popular Mechanics is very detailed and has a complete measured drawing. Hi – I was wondering if anyone has tried to build the Ubuild version of the Adirondack Chair? The plans themselves leave a little to desired. Does anybody have a more complete set of plans or has built it and refined the plans?? Any help would be wonderful!